Belarus’ Andrei Skabelka has been appointed as the new coach of Kazakhstan’s ice hockey team, it has been announced. 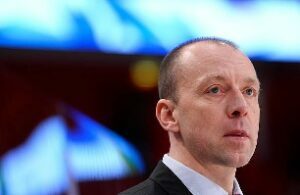 The 47-year-old will combine his role with being head coach of Kontinental Hockey League (KHL) club Barys Astana. The head coach of Barys traditionally is also in charge of the national team in Kazakhstan as the team serves as the main club for the national team roster. Skebelka replaces another Belarussian, Eduard Zankovets, and will be expected to lead a successful challenge when Kazakhstan hosts the International Ice Hockey Federation (IIHF) World Championship Division I Group A on home ice in Astana next year. “Of course the national team of Kazakhstan will have to return to the elite since we will host the World Championship of our division at home,” Askar Mamin, the President of the Kazakhstan Ice Hockey Federation, told Russian news agency RIA Novosti. It will be the first time Kazakhstan has hosted an IIHF World Championship event. “Holding the World Championship [Division I Group A] in Astana will be a stimulus to increase the popularity of hockey in Kazakhstan,” Mamin said. As a player, Skabelka represented Belarus in 12 World Championship tournaments and two Winter Olympic Games at Lillehammer 1994 and Turin 2006. He also coached Belarus in two World Championships. Belarus will be among the teams taking part in next year’s IIHF World Championships, due to take place between April 29 and May, along with Hungary, Lithuania, Slovenia and South Korea. The top two teams will be promoted to the 2020 IIHF World Championship in Switzerland. Kazakhstan have not played in the elite division of world ice hockey since being relegated in 2014. Skabelka has also worked as a coach in the KHL for Torpedo Nizhni Novgorod, Sibir Novosibirsk and Avangard Omsk. Jett Woo of Moose Jaw in the Western Hockey League could become the second player of Chinese descent to be selected in the first round of the NHL Draft. Woo, 17, is a right-shot defenseman listed at No. 28 on NHL Central Scouting’s final ranking of North American skaters for the 2018 NHL Draft. He was born and trained in Winnipeg; his father, Larry, is of Chinese descent and his mother, Dolly, is of German ancestry. Jett has spent a lot of time learning about his Chinese grandparents and said he hopes to have an opportunity someday to play an NHL game in China. The Boston Bruins and Calgary Flames will play in the 2018 O.R.G. NHL China Games Sept. 15-19 in Shenzen and Beijing. Woo would be the second player of Chinese descent selected in the NHL Draft; the New York Islanders picked Lawrenceville School defenseman Andong Song in the sixth round (No. 172) of the 2015 NHL Draft. Woo said he recalls spending time with his grandparents at their house in Winnipeg, learning about their culture and their cuisine. Woo’s grandparents were born in Canton, China and owned a small restaurant chain in Winnipeg called Marigold. His grandfather has since passed away. Even though Woo is looking to break new ground in the NHL, he is considered a throwback-type hockey player. Woo (6-foot, 205 pounds) had 25 points (nine goals, 16 assists) in 44 games, and had three points (two goals, one assist) in 14 WHL playoff games. He’s become a fan favorite in his three seasons with Moose Jaw, and fans at Mosaic Place, Moose Jaw’s arena, serenade him with a loud “Woo,” reminiscent of professional wrestler Ric Flair, after big hits. Larry Woo played forward for Victoria and Swift Current in the WHL and then for four seasons for the University of Manitoba. Larry and Dolly named Jett, the oldest of their three children, after Chinese film star Jet Li. Larry Woo played Park Kim in the movie “Goon” in 2011, and its sequel, “Goon: Last of the Enforcers,” in 2017. Woo wears No. 4 to honor Hockey Hall of Famer Bobby Orr, and said he’s also a big fan of Montreal Canadiens defenseman Shea Weber because of his intimidating presence. “I feel having that extra grit kind of helps me in the game,” he said. “I always bring it back to Shea Weber. One time I watched a game of his and a player was coming down on his side but cut across to the other defenseman and I think it was because he didn’t want to take Shea Weber 1-on-1. That’s something I want to bring to the game; be that guy that opponents are scared to play against.